I didn't make a big deal on the blog about reaching 7 days below 100 on my fasting glucose. I've been waiting for that since December 2. I'm glad I'm there. Today I even forgot to measure. I'm happy that I'm not upset about anything less than 110. That's the goal the clinic set for me and I'm definitely beyond what they expect. I'll be pondering an extended fast. I know I have years of high insulin to reverse. Someone sent me a video of an elder playing the accordion and that's a good goal to hold out for myself. I've hit 160 so I'll be doing pictures tomorrow! Glad that my wife was willing to take measurements for me. These will be every few months. Measurements are in inches. I'll post again by June 30th. Procedure went OK. Took me off working out on Wednesday. Overhead Press 55, 55, 55 all three sets to 12! I hit 7 days in a row with fasting blood glucose of below 100 mg/dL! My weight on Friday morning was 160.8 and blood pressure is 117/76. I can't find the measuring tape so I don't know where my waist is at. My sleep pattern seems to be thrown off from being knocked out on Wednesday. At least it let me catch up on the blog. I get inspiration to keep at it from my friend Roberto. A chunk of people have given me compliments this week. That's been cool. However Roberto has asked me deeper questions. From what I'm reading from Dr. Fung it is cortisol (which raises insulin) and insulin which causes obesity and diabetes. So I asked several docs I know if they measure cortisol or insulin. I had answers like "it's not very useful clinically." This is interesting given that I've known these are risk indicators for working-class people and people of color. I'm also not a clinician so I'm not going to pass judgement, I'm just going to continue to educate myself. I can say that the standard advice of "graze" and eat a lot has not been useful. I've done better from fasting and having longer periods of low insulin. I think I've cleared most of the excess sugars from my system. My body is still recuperating from insulin resistance and that may take a while to reset. The Complete Guide to Fasting has come in the mail and I'll start reading that. I'm still finishing up The Obesity Code and recommend it for others. Lots of people have come to talk to me about creating self care support groups. It's exciting. Time to nap and get up for a HIIT bike workout by 8AM! I did measurements this morning. Worked out. I'll post more on that later or tomorrow. I'm prepping for a colonoscopy so I might not be feeling communicative later. Hopefully it is all good news. I put it off in December because learning about diabetes was enough rough news, especially after ER visits from me and family, a death in the family, etc. Hoping for a better and healthier year! I'll be reading The Obesity Code by Jason Fung this week. I used to fast at least once a year for 10 days before new year. And on occasion during semana santa (mostly because no one would question that like when I would fast from Dec. 21-31). Had lots of people freak out and tell me what harm I was doing to myself. Then there were countless articles on how fasting was bad for metabolism. I finally gave up the practice. New research shows that I may have been better off continuing that practice. Regardless I'm back on a different approach to fasting now and it seems to be working well. Been an interesting week off work. I did make some goals. I hit 165, and also 40 inches around my waist. I checked my Vo2 Max and it is 34.7. And here are the progress pics and I may post some thoughts later. I multiplied that all by 20, then I divided by 12 and rounded down. So this is what I will start with today on set one. If it is easy I'll increase 5 pounds each set until I can barely get 12 reps in. This may not work. I'll be tracking and reporting back. Some of these feel high looking at them. I'm not going to feel an shame for not being able get some of these. This is just a way to get a guesstimate and if it is off I can just adjust. What counts most is to challenge myself and progress. 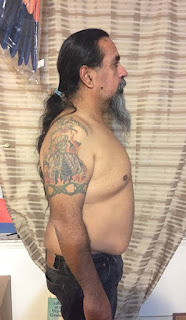 Fasting glucose 89, weight 167.4 pounds, blood pressure 120/75 78, and waist 41 inches. You can compare at the Progress Pics page. 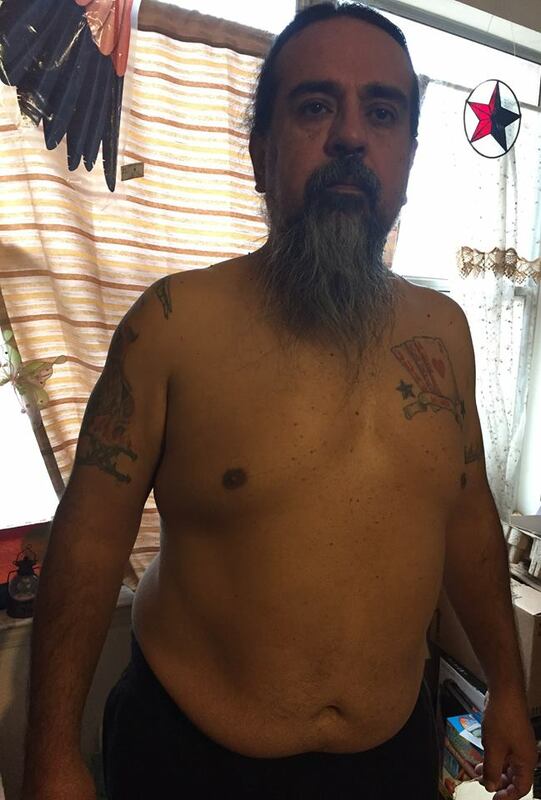 Fasting glucose 89, weight 167.4 pounds, blood pressure 120/75 78, and waist 41 inches. An even inch on the waist means it is photo time so there will be one posted late tonight or tomorrow. Did my last 20 rep weight workout, I'll be dropping to 12 reps next week (I had thought about 15 for a while) and adding weight. I'll post what I intend to do before Monday. I've also had good talks with various people and some people want to try some form of what I've been doing. I'll try to be of support and hope for the best. We all have to find a route and it is always better with support. We live in a highly individualistic society where we think "everything is on YOU" and that's not helpful for everyone. So continuing on! Running late today. 88 mg/dL for fasting blood sugar today. That's three days below 100! Weight was 167.8 pounds. Blood pressure was 126/68 with 82 pulse. 41 1/2 inches for my waist still. Today was a HIIT bike workout. I'm hoping over the weekend to post some information from The 8 Week Sugar Diet. Next week I start lifting for muscle development and more. Feel free to ask questions, make requests, and such from this blog. Might be good for me to get an idea on how to make this helpful to others. My fasting glucose this morning was 94, weight was 169.0, blood pressure was 119/77 and 73 pulse. I didn't measure my waist and I just finished breaking my fast with a turkey salad so it is probably not the best time to measure. I'll measure tomorrow. So a few people said that they were inspired to workout or focus on something about their health from my FB posts. I'm glad that some of the writing is helpful. I'll see how I'm feeling tomorrow night to decide if I might fast on Friday. Maybe the best thing today was a friend telling me sorry about the diabetes. She then went on to tell me about her mother having diabetes. I talked with her a little bit about me dealing with this without medications and that I would share what little I've learned. So I'm trying to figure out what I can share with people comfortably. I will also learn what I can about fasting and inflammation. Maybe there is something there for my arthritis and stenosis. Fasting glucose was 80 mg/dL! A great number. Weight was 169.2 pounds. So two small milestones in one day. Blood pressure was 115/75 with 88 pulse, and waist was 41 1/2 inches. I also made a log for health stats like those above, and one for my workout. Today was HIIT on the bike and I'm up to 4 on the resistance during the sprint portion. These pictures will go into the progress pics. Next pictures will be of when I get to 41 inches even, or below. Hopefully that doesn't become too often. Feel free to comment about that. I forgot to hit "publish"! I did get the book and got to page 87 on day one! It is very interesting and I will be sharing what I think is important. So here are yesterday's numbers, I'll post today's numbers tonight. This morning my fasting glucose was 108 mg dL, weight was 170.6 pounds, and waist was 41 and 5/8 inches. Blood pressure was 122/84 with 79 pulse. My workout today with 3 sets of 20 reps. I think I'm going to change my mind and go to 3 sets of 12 next week. I received "The 8-Week Blood Sugar Diet" today. So I'll check this out and may wait on reading the others when I get them. Numbers yesterday were 107 for fasting glucose, 171.2 for weight, 128/78 84 for blood pressure, and 41 3/4 for waist. The fasting glucose this morning was 111. The fact that my glucose and blood pressure are creeping up is interesting. This may be genetic or may be what is called dawn phenomenon. I think I'll 24 hour fast Monday and Wednesday this week and see how that goes. If my blood pressure creeps up any more I'll likely go back on the hydrochlorothiazide at half dose for a while longer. I'm up early and the gym doesn't open until 8 am. That's the downside to the YMCA. Being around elders and also not having a bunch of resolution people is good. So I've been thinking about fasting. I haven't decided to purchase Jason Fung's book on it yet. A friend sent me a link to an inconclusive study. I followed the link and then came across this article on intermittent fasting and weight lifting. I'll check in later today or early tomorrow on numbers. I'm going to try alternate day fasting this week and see how I do. The intermittent fasting seems to be helpful so far. I'm going to keep that up. Here's a straight forward, and working class friendly video on timing of eating. I think everyone has their own road to health so I'm just sharing ideas, or things that are working for me. If something works for you and makes me worse, I'll support you. If something I'm trying doesn't work for you I won't get hurt each body responds differently to different things. Snow in Burque! Saw a car up on the sidewalk on the way to the gym. It was a slow drive. Fasting glucose this morning was 93 (I'm happy with anything below 100). 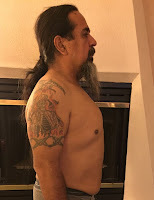 Weight 172.0, a small loss. Office is closed so I don't know if I'll get a blood pressure reading today. I want to because I felt it a little high yesterday. Hopefully I didn't celebrate getting off of my meds too soon. At least I still have a month's worth. Today was weight day. The gym was fairly empty and I was letting myself get distracted thinking about the blog and all. On the 16th I go 15 reps and start increasing weight. I hope to get to 170 before the 16th since as I start going heavier I should increase muscle mass and my weight will be less helpful as a measure. I've decided that I will take pictures at milestones. So every 5 pounds, so 170, 165, 160, etc. Also every inch lost, so 41, 40, etc. And when I'm off another med. Fasting glucose was 106, weight was 172.6 again, and blood pressure was 118/76 with 76 heart rate. Did the HIIT bike workout and lift tomorrow. I'm working at figuring out how to build some momentum as I'm feel a small plateau. Waist is still 42. It is definitely a challenge to get all the easy support and I can see how I could have been more supportive to others in the past. Fasting glucose was 87 this morning, weight 172.6, and blood pressure 111/77 74. 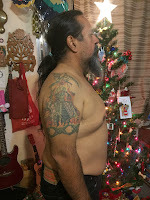 Did my weight routine and shared my thoughts about diabetes and public health with friends. Overall a good day. About to go to a meeting where we will get fed. Supposed to be BBQ so I should be fine. Weighed in at 175 lbs and had a blood pressure of 110/74 at the doctor's office. Had a good talk with my doc. She was super supportive and impressed with my changes. We talked about what I've been doing, no sugar, no white bread, and trying out different things as far as eating and exercise. She was good with my fasting and I get my A1c rechecked on March 1. I shared with her a few things I've been reading about and she gave me feedback that made sense. I showed her this video on HIIT and mentioned this talk about exercise and public health. Physically I am still hoping for a big increase in energy. It is slowly improving and I know it will take a while to get there. It took years to get me here and hopefully I'll get back to my "100%" self soon enough. Thanks for those who have been supportive. I know this week has given me a positive start on the year. After the 16th I'll assume weight is less important than waist as I'll start to lift a little heavier. Don't know if I'll ever get back to power lifting, or to any kind of running. I'll be happy with being off of my meds and reducing or eliminating any of my diabetes symptoms. I also am starting to look through a friend's blog that includes information on diabetes and more. I think I'm going to add waist and VO2 max to my picture updates. I'm trying to decide how often to take and post. So today my waist is 42 inches at belly button, VO2 max was 33.6, slightly better than initial test of 32.6. Goal is to improve. 41 would be amazing. Weight was 173.4, and blood pressure was 119/70 75 on second day without hydrochlorothiazide. My fasting sugar this morning was 105 mg/dL. Completed my HIIT this morning and I increased the resistance on the sprint portion one more notch. The machine has 1-20 and I'm up to 3 on the sprints now. I'll see how the conversation goes with my doctor this afternoon. I've been talking with my immediate family about cutting my hours of eating, or "eating window." It's been great having very little soda in the house. I'm not drinking any, and my son has reduced his use some. I think it is helping. Off to the doctor's office. Blood sugar was 87 today! Yesterday I had salad and some nuts around noon. Not a full fast yet a decent experiment. I think as close as I can get to the 16/8 intermittent fasting may be what works for me. Might also have one full fast day a week. Read a depressing blog post from someone else. Still know that I can't let those things get me down. Made it to the gym this morning, later than usual and the person at the desk noticed. He also said that there weren't that many new people. 1 or 2. That might be good for not getting crowded out. Today was lift day. Two weeks before I increase weight and reduce sets. Celebrated my blood sugar with some bacon and eggs. Checked my blood pressure and it was 121/76 with a heart rate of 72. This is on the first day without the hydrochlorothiazide. So I won't take it tomorrow and see what it is before my afternoon doctor's appointment. Weight was 174, same as Saturday which isn't bad considering the extra eating on Saturday. I'm going to keep going and hope to sort out what actually works for me and my body! My fasting blood sugar this morning was 109. Not bad after New Year's Eve festivities. Today I'm reading about exercise and fasting, and also about intermittent fasting. I'll also be watching these videos of Dr. Jason Fung talking about fasting. I'm finding myself less hungry overall other than some serious chili dog cravings on Friday. My intentions for the first couple of months of the year will be zero soda, zero alcohol (except for maybe for my anniversary), and minimal breads, low processed foods in general. Hopefully no one gets laid from my no longer going to get my breakfast burritos! Instead of "before and after" I'll call these progress pictures because my new habits have to be more long-lasting than the short-term diet or exercise routine. In 2005 I posted progress pictures and definitely saw changes. 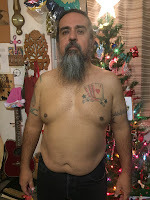 I didn't take pictures on December 1, 2016 because I wasn't thinking about the blog or losing weight at the time. So I started at 190 pounds, blood pressure around 120/80 on a good day while taking 25mg of hydrochlorothiazide, 5mg amlodipine, 40mg atorvastatin, 20mg Lisinopril. These first pictures are at 173.6, blood pressure 121/73 and resting heart rate of 81 while taking 1/2 of the hydrochlorothiazide. I weigh in at the gym before eating and before working out so it is lower than what I will weigh in at the doctor's office. 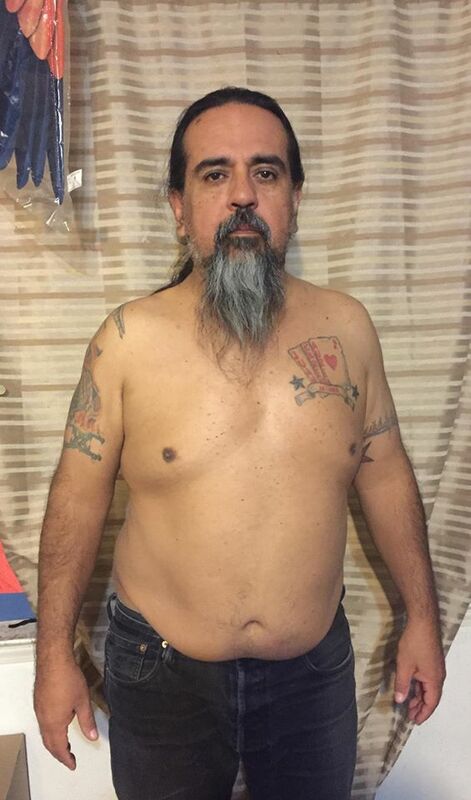 Fasting glucose 80 mg/dL, weight 169.2 pounds, blood pressure 115/75 with a heart rate of 88 without the hydrochlorothiazide, still taking 5mg amlopidine, 40mg atorvastatin, 20mg Lisinopril. 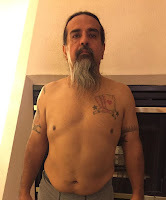 Waist is now 41 and 1/2"
Fasting glucose 89, weight 167.4 pounds, blood pressure 120/75 and resting heart rate of 78, still taking 5mg amlodipine, 40mg atorvastatin, 20mg Lisinopril, and waist 41 inches! The pictures seem really close together in time so maybe I'll space them out even I hit the two different goals of even inches or 5 pounds at the same time. 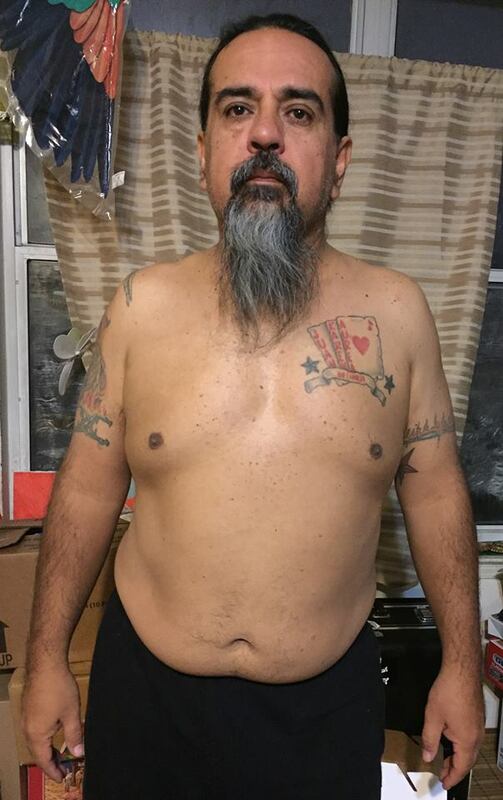 Fasting glucose 80 mg/dL, weight 165 pounds, Vo2 Max is 34.7, and waist 40 inches. I'm still on the same meds as above. I hit 160 pounds and 39 inches this week. Lowest blood pressure this week was 99/69 and 72 pulse. My fasting glucose this morning was 80. The highest I've had this week was 104. I'll test my VO2 Max this week. Last VO2Max was 41.3! I'll test again soon as that seems like a huge improvement. Maybe it's correct, maybe it was a different machine. November 2017. Weight is near 150 pounds pretty consistently. My last A1C test in September was 4.9! In March it was 5.0 which was better than expected. I may post pictures again soon.